Concrete is a basic building material that will continue to be in demand far into the future. A world without concrete, and its dominant precursor, Ordinary Portland Cement (OPC), is hard to imagine. Although there are different types of concrete that have been developed for use in different applications, their common virtues are familiarity, versatility, strength, durability, wide availability, fire resistance, resistance to the elements and comparatively low cost.Cement industry is growing at a rapid pace in India and over the globe. Many new brands are available in the market but selection of good cement is very important for an engineer. Many a time construction project fails due to poor quality of cement. This paper will show you what are the factors affecting the selection of cement and cement strength classification. Also, the quality control of cement and need of consistency of quality in cement. Thus the project, can be secured to extent with the selection of proper quality of cement. India is the second largest producer of cement in the world. Ever since it was deregulated in 1982, the Indian cement industry has attracted huge investments, both from Indian as well as foreign investors. In India the cement industry underwent a number changes and reforms mainly to suit the government policies and the economics of the manufacture. The annual cement production from nearly 5 million tonnes in 1952 shot up to over 54 millions tonnes in 1993. The strict government control for years and rising costs of production of poor quality of cement thereby resulting in poor quality of concrete structures. Cement demand in India is expected to increase due to government’s push for large infrastructure projects, leading to 45 million tonnes (MT) of cement needed in the next three to four years.India’s cement demand is expected to reach 550-600 Million Tonnes Per Annum (MTPA) by 2025. The housing sector is the biggest demand driver of cement, accounting for about 67 per cent of the total consumption in India. The other major consumers of cement include infrastructure at 13 per cent, commercial construction at 11 per cent and industrial construction at 9 per cent.The partial relaxation of Government control from March 1982 and a total relaxation of control after March 1989 revived the cement industry and resulted in its phenomenal growth. This resulted in a competitive market and cement manufactures had to improve their quality of cement, as it was now a battle foe survival of the best. After late 80s cement manufacturers took a huge step modernising their old plants, which were in various stages of obsolescence. The wet process plants were converted to more economical and dry efficient process or semi-dry process plants. This leads to the production of high quality cement. Several leading organisations diversified into cement manufacture and thereby created the much desired consumer oriented market with the range of brands available at competitive prices.The 33-grade ordinary Portland cement (IS: 269-1989) has virtually disappeared and is displaced by higher strength ordinary Portland cement of 43-grade (IS: 8112-1989) and 53-grade (IS: 12269-1987). Since there are various options available in market the consumer has a good option to select the product required. However, this process depends on the main factor of finance. With the financial constraints, the other factor to be considered is the specifications.It must be understood by the consumer that any good quality product is generally available at a higher price than a not so good quality product. It is therefore necessary for the consumer to know more about the benefits he gets when he selects a high quality cement and how best he can put to use such benefits considering both technical as well as the economical aspects. A high strength cement although preferable to a lower strength cement may not give a consumer the complete benefit until and unless it is giving consistently high strength with minimum variations.The high strength concrete if specified for any structure will also be more desirable from a durability point of view. It is often observed that low strength concrete is more vulnerable to environmental forces than high strength concrete but at the same time, high strength concrete too needs to be extremely carefully batched, mixed, transported, placed, compacted and cured. The durability requirements of the structure are as important, if not more, as the strength of the structure. A strong concrete may not result in high performance concrete if the durability requirements are not complied with. Selection of high quality cement can only mean a good beginning but it does not assure the consumer of a final product, which is the strong and durable concrete structure. However, selection of poor quality cement or cement of inconsistent quality is like taking a wrong step right at the beginning and will certainly lead to the poor quality concrete structure if not a disaster. The most common type of cement used in India is ordinary Portland cement (OPC) and has generally grades viz. 33, 43, 45 grade depending upon the 28 days compressive strength. IS: 10262-1982 gives us the recommended guidelines for concrete mix design, has generally classified the cement grade wise from A to F, depending upon 28 days strength as follows. However, it may noted that some brands sold as 53-grade cement generally give 28 days strength of around 625 to 675 kg/Sq.cm and they can be classified even as G grade cement. However, most of the 53-grade cement available in the market generally falls in the category F or above and the 43 grade cement available in the market are generally in the category D. It must be ascertained either from the manufacturer or through laboratory tests the actual strength of the cement before it’s use in the concrete mix design to get the maximum benefit of the additional strength and superior quality. The relation between the free water-cement ratio (W/C) and concrete strength for different cement strengths (grades A to F) is given in fig. 2 page 8 of IS: 10262-1982. This figure is used to determine the W/C of the concrete mix for specified target concrete strength if the cement grade is known. The target concrete strength (fm) is calculated using the following equation fm=fck+ (t*s) where ‘fck’ is the specified characteristic strength, ‘t’ is the statistical constant generally equal to 1.65 for the specified accepted proportion of low results of 1 in 20 (see table 2) and ‘s’ is the standard deviation, the values of which are selected depending on the degree of quality control expected under different site conditions (see tables 3 and 4). Table 3: Degree of quality control Expected (IS: 10262-1982) under different site conditions. Very good: Fresh cement from a single source and regular tests, weigh-batching of all materials, aggregates supplied in single sizes, control of aggregate grading and moisture content, control of water added, frequent supervision, regular workability and strength tests and field laboratory facilities. Good: Carefully stored cement and periodic tests, weigh batching of all materials, controlled water, graded aggregates supplied, occasional grading and moisture tests, periodic check of workability and strength, intermittent supervision and experienced workers. Fair: Proper storage of cement, volume batching of all aggregates allowing for bulking of sand, weigh batching of cement, water content controlled by the inspection of mix and occasional supervision and tests. Table 4: Recommended values of standard deviation IS: 10262-1982 standard deviation(s) for a different degree of control N/mm. Sq. From table 4 it can be seen that better quality control results in a lesser value of’s’ and ‘fm’ for same ‘fck’. Therefore cement consumption works out to be lower when the quality control is better. Hence, for concrete manufacture better quality control results in greater economy. However, the durability requirements as specified in IS 456- under revision must be satisfied depending on the various exposure conditions. From table 5 it is obvious that concrete manufactured using a higher grade of cement even after considering that lower grade cement may be marginally cheaper than the higher-grade cement. Table 6: Requirement of durability as per IS: 456-2000. Maximum cement content, maximum water-cement ratio and a minimum grade of concrete for different exposures with normal weight aggregates of 20 mm nominal maximum size. Note 1- Cement content prescribed in this is irrespective of the grades of cement and it is inclusive of Mineral Admixtures specifies in IS 456-2000. The additions such as fly ash or ground granulated blast furnace slag may be taken into account in the concrete composition with respect to the cement content and water-cement ratio if the suitability is established and as long as the maximum amounts taken into account do not exceed the limit of pozzolona and slag specified in IS 1489 (part 1) and IS 455 respectively. Note 2- Minimum grade for plain concrete under mild exposure condition is not specified. Table 7: Concrete under different exposure conditions. Moderate Concrete surfaces sheltered from severe rain or freezing whilst wet. Concrete exposed to condensation and rain. Concrete exposed to non-aggressive subsoil/ groundwater or coastal environment. Severe Concrete surfaces exposed to severe rain, alternate wetting and drying or occasional freezing whilst wet or severe condensation. Concrete in contact or buried under non-aggressive soil/ ground water, completely immersed in seawater. Very severe Concrete surfaces exposed to seawater spray, corrosive fumes or severe freezing conditions whilst wet. Extreme Concrete surfaces exposed to abrasive action, for example, machinery metal tyred vehicles or water carrying solids. Surface or members in tidal zones. Members in direct contact with liquid/ solid aggressive chemicals. 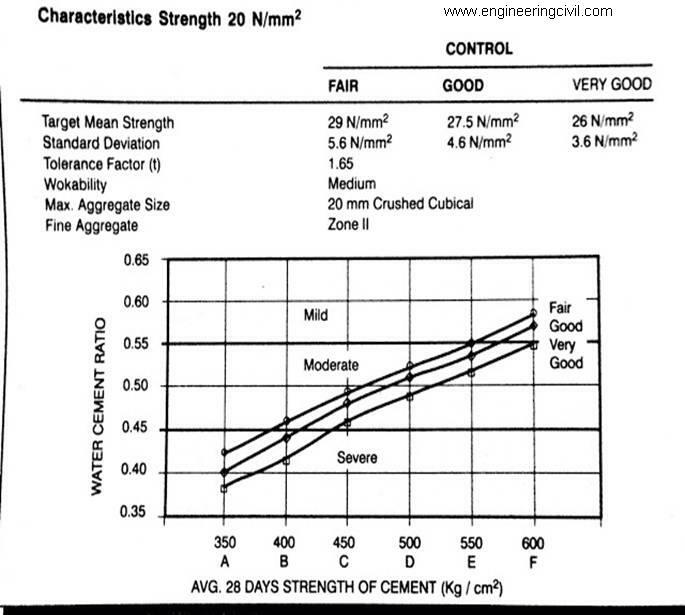 The figure below shows that F grade cement can be utilised for 200 kg/cm. Sq. Reinforced concrete in mild environment condition only while C to E grade cement can be used for mild or moderate environmental conditions. However, for high-performance concrete generally, it is very important to go for a higher grade of concrete (above M25 grade). If this concrete is made with high strength cement then it will fetch both technical as well as a financial advantage. Table no. 7 shows the extent to which different grades of cement can be used for different environmental conditions and various grades of concrete. It is generally observed that even today the structural engineers and architects specify the M15 and M20 grade of concrete in the coastal area. This has already led to serious durability problems and low performance of concrete structures. M15 grade concrete can be achieved with W/C much greater than 0.55 if 43 and 53 grades of cement are used and since 33-grade cement has now virtually disappeared from the market. All M15 grade concrete structures in coastal areas are therefore bound to be a happy hunting ground for concrete rehabilitation agencies as is being observed at present. The durability problem is most likely to multiply several times if, at the specification stage itself, proper precautions are not taken. Even M20 grade concrete may not be the correct solution to the durability problem in the Urbanised/Industrialised coastal areas. Lower grades of concretes with the generally poor type of quality control prevalent are observed to be of very poor durability, needing of extensive repairs within a few years. As good quality cement are now available it is strongly recommended to go in for higher grades of concrete i.e. above M25 grade. This will improve the performance of the structures; prove more economical in most cases and in the process of achieving higher strengths it will automatically comply with the durability requirements. Concrete mix design(CMD) is one of the techniques to determine the most economic proportions of cement, sand, aggregates, water and other additives. However, after choosing the economic proportions of various materials any change in their physical or chemical property will lead to considerable variations in the desired cohesiveness, workability, strength and durability. The maximum impact is always due to variation in cement properties and therefore it is not only essential that cement should have good strength, proper fineness and correct setting time but it is also essential that the variation of its chemical and physical properties especially the strength and fineness should be minimal. The good quality in minimising variations is now possible with proper quality control monitoring systems and modern sophisticated instrumentation control systems the cement manufacturers have installed in their modern up to date plants. While high strength is the indication of the good physical quality of cement, consistency of this high strength and other physical and chemical properties is an indication of good quality control and superior technology practised by the cement manufacturing company. The quality control in the cement manufacturing plant starts from the inspection and testing of the limestone. Only after extensive testing for its CaO content, it is utilised, making sure that CaO content is uniform.The thoroughly crushed limestone powder is then stored in a stacker. It is reclaimed in vertical slices to get homogenous limestone, which is then conveyed, to the vertical ball mill, which ensures uniformly crushed limestone. After this, homogenisation of the limestone is done in the blending silo by means of aeration. Thereafter homogenized materials are passed through series of suspension preheaters and are fed into the kiln for the production of clinker. Hourly samples of clinker are taken and tested to assure uniformly of quality. On line X-ray analyzers’ help in ascertaining the variations in compoundcompositions of the cement so that immediate action can be taken to improve the quality of the product if required. The clinker is then processed through closed circuit grinding. This ensures proper particle size distribution. A device called high-efficiency cyclonic separator, which controls the grinding process right down to the specific micron size required, does this. After initial grinding in the tube mill, the materials move into the high-efficiency cyclonic separator. The separator separates the ground particles into two streams. The airflow exerts an aerodynamic force and separates the finer particles (between 5 and 30 microns) from the oversize coarser particles (above 30 microns), which are influenced by centrifugal and gravitational forces. The coarse particles are collected into grit collection and brought for recirculation into the grinding process. The fine particles are removed from the air stream in high cyclones mounted symmetrically around the separator housing. This process assures that cement has the ideal surface area and the ideal proportion of particle size between 5 to 30 microns. This process guarantees the highest number of a particle between 5 to 30 microns to the extent of over 50%. Hourly samples are taken and tested to assure uniformity of quality. The consistency of particle size is checked using sophisticated particle size analysers, which immediately indicate the grain size distribution. Adjustments required in cement productions, if any, can be controlled in the plant to obtain the optimum particle size distribution and thereby assure consistent quality. If cement has a large number of particles finer than 5 microns it tends to set quickly producing high early concrete strength without a corresponding increase later on. This cement is also more susceptible to moisture attack and hydrates fast resulting in unnecessary wastage. On the other hand, if cement possesses a large number of particles above 30 microns it takes longer time than normal to set and will also display low initial strength which increases at a later stage. The cement is then transferred to the packinghouse where it is packed in woven HDPE and 4 ply paper bags and transported to various stockists and construction sites. The hourly samples are also collected from the packinghouse to check the quality. Daily tests for various chemical and physical properties are done and various parameters are recorded to study the monthly variations and to improve the product quality from time to time and thereby minimise variations. Many do clearly not understand the importance of consistency of cement quality hence a small illustrative example is given below.Assume that three brands of cement say AA, BB and CC are available having identical mean strength for a particular month of manufacture, say 600 kg/cm. Sq. However, the standard deviations for these cement during the same month were different and therefore the characteristic strength of this cement and its grade are worked out as below. Hence from the above, it can be observed that cement having identical mean 28 days strength for the month can be classified as F, E or D based on the variations (standard deviation). It is therefore of prime importance to control these variations to the barest minimum so that the cement can be classified as a higher grade. It is generally observed that monthly standard deviation if ranging between 15 to 25 kg/cm. Sq. can be considered as a good control for cement manufacture. Besides saving of concrete quantity and cement cost per cubic meter of concrete, there are several other advantage and savings due to the use of high strength cement. It is observed that the best advantage of specifying high strength cement is derived if, at the planning and design stage itself, high grades of concretes are specified. The higher-grade concretes may have a smaller cross sectional area under identical conditions and thereby the quantity of concrete reduces considerably. The saving in concrete quantity can easily between 1% of 25% depending on the type of structural member, its layout and its function. However, in addition to this saving, higher grades of concrete will be less permeable and more durable than lower grades. Reduction in the quantum of finishing works such as plaster, painting etc. Overall saving of manpower and construction time. Increase in the carpet area of the building. In short high cement if specified at the design stage itself and utilised for the high grade concrete structure will be more economical than if the lower grade cement is specified. This will benefit the user in giving a structure, which is stronger, and more durable and economical.With high-grade cement, it is now possible to attain QUALITY SPEED AND ECONOMY. So make your concrete structure ‘fast’ and to ‘last’. 2. (IS: 8112-1989) ‘Specification for 43 grade Ordinary Portland Cement’ Bureau of Indian Standards, New Delhi. 3. (IS: 12269-1987) ‘Specification for 53 grade Ordinary Portland Cement’ Bureau of Indian Standards, New Delhi. 5. IS: 456 ‘Plain and reinforced concrete’ Bureau of Indian Standards, New Delhi. We at engineeringcivil.com are thankful to Shubham Sunil Malu for submitting this very useful paper to us. We hope this will be of much help to all those who are seeking more information on high quality cement and its usage.